Our laundry service is an excellent alternative to washing cloth nappies at home, especially during the first six months when you've got more than enough to do. Since 2003, we’ve helped upward of 750 customers use cloth nappies – some stay with the laundry service until toilet training and return with second/third/fourth children while others move onto home-washing once the routine is established. Laundered to NHS standards, our soft cotton nappies are a viable and convenient alternative to single-use nappies. Our nappy laundry service is available in the London boroughs of Hackney, Islington, the City of London and Camden. We use green freight bikes for our nappy delivery service and concentrate our customer base over a restricted geographical area. This makes our service a thoroughly green alternative to single-use (misleadingly known as 'disposable') nappies. EC1, EC2, E2, E8, E9, N1, N4, N5, N7, N16, N19, NW1, NW3, NW5, NW8, WC1, WC2, W1. We also supply children’s centres and nurseries in the three London boroughs – if you’d like your nursery to use our service, then please let us know and we will contact them. We can deliver the starter kit to you at any time – a few weeks before your due date or after the birth. These costs are just an example. If you already have waterproof wraps, choose different ones or start when your child is older, the starter kit price will vary. 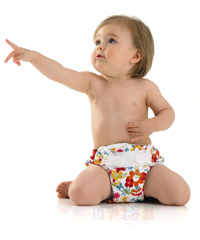 Real Nappies for London vouchers can be redeemed against the cost of our nappy laundry service. The price above is the current maximum voucher value available from some London boroughs. You do not need to apply for a voucher if you join the laundry service. We can do this for you.